The Johnson’s Monument Club Handicap race is an annual cross country event which is designed to have an many of the racers crossing the finishing line in in quick succession as possible. It is quite a a sight when you have runners who have started the race up to 40 minutes apart all in the finishing field racing to the finishing line. 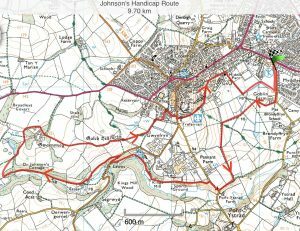 The course was set up in 1992 as a measured 10k race mainly on local footpaths using the handicap system where the slower runners start off first. Over time the course has shrunk to 9.7k with 156 metres of climbing. All club members and second claim members are eligible to run the race and it is always competitive. The race is always followed by a meal together.